In 1935 the electoral constituencies of the Irish Free State were changed, though the next election was not until two years later. 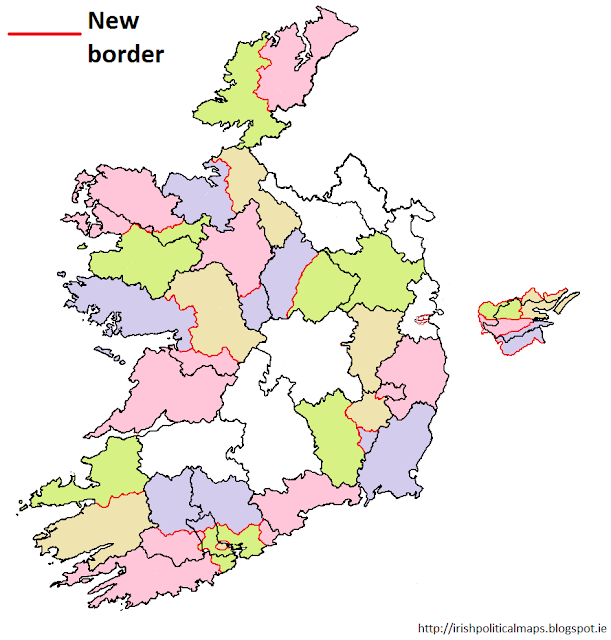 This reorganisation of the constituencies involved the splitting of some (such as Donegal into Donegal East and Donegal West) and the complete abolition of others (Carlow-Kilkenny, for example, was abolished and replaced by both Carlow-Kildare and Kilkenny). This reorganisation also saw the reduction in seat sizes of many constituencies.The size of the Dáil had been reduced from 153 seats to 138 (a reduction of 15) and this was reflected by the now familiar constituency sizes of 3 to 5 seats - though some, such as Limerick and Dublin South, still boasted 7. These constituencies served four general elections (1937, 1938, 1943, 1944) and the state's first referendum in 1937. They remained in place until the 1948 general election. The 1937-48 boundaries superimposed in red over the previous boundaries.